• The device must be connected to the Internet. Please check if the connection is setup correctly. • Please confirm the Internet access ports are open. The default ports to open are: 80, 554, and 37777. To modify the default ports, please refer to DDNS User’s Manual. • Please enable UPnP and PPPOE functions on the device if needed. For UPnP and PPPOE setup, please refer to DDNS User’s Manual. • The default username and password are admin/admin. You should change your password at the first login. • The IP address of the DVR can be found in the Setting>Network>TCP/IP section. 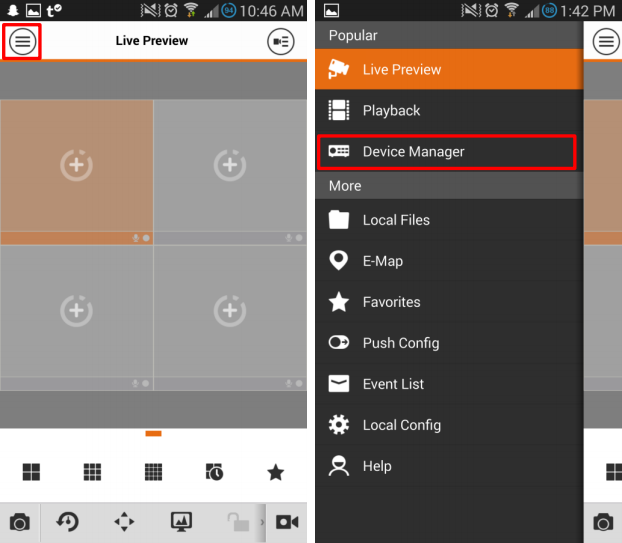 • The device supports monitoring and DDNS management via a smart phone. You need to download the App first. • Please keep the tag of the device’s MAC address. Do not lose or destroy it. 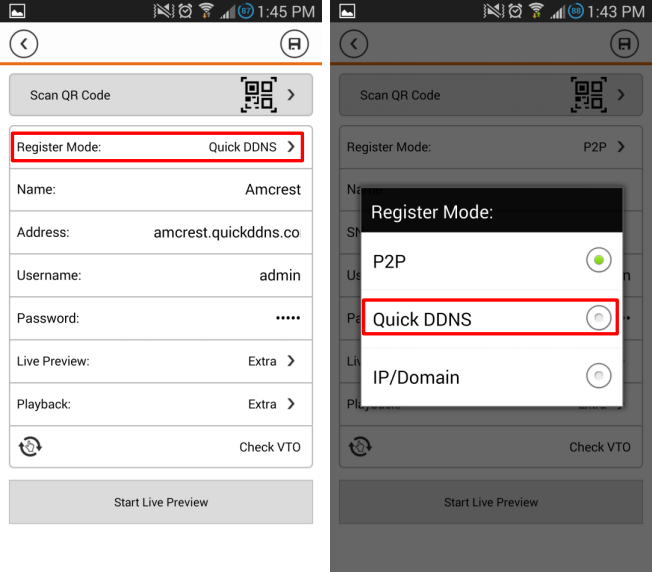 • Quick DDNS service is disabled by default, and to enable it, you need to login first. After the device boots up, please wait 1 to 3 min until the network indicator becomes green. Input the device IP address (found in the Setting>Network>TCP/IP section) in a web browser. After logging in, go to Setup>Network>DDNS. You can modify the DDNS setup in the corresponding fields. Please see Figure 1: Enable Domain Name Access. 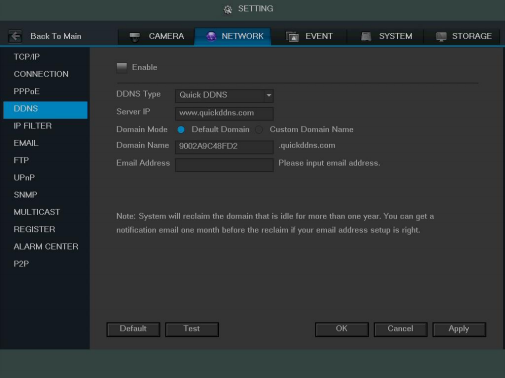 For server type please select Quick DDNS and enable DDNS by checking the Enable box. Click on OK to save. The default domain name of device is: MACaddress.quickddns.com. For example, current device MAC address is: 90:02:A9:01:08:84. 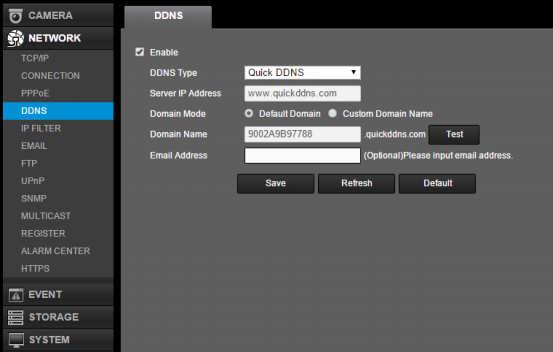 You can input domain name as 9002A9010884.quickddns.com in a web browser to access the device. If the device is connected through a router, then you need to log on the router to view all of the mappings and access the device via the domain name plus port number. Note: The MAC address of each device is labeled at its rear. 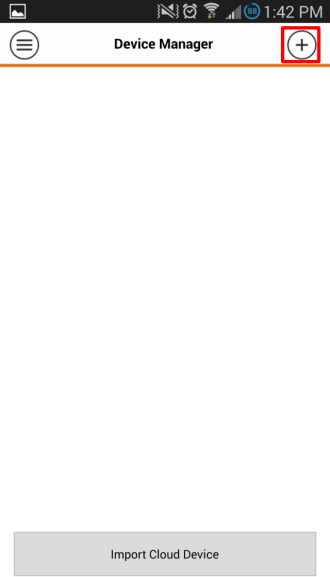 When you input the domain name in a web browser, you should exclude the “:” symbol. After the device boots up, input device IP address in a web browser. After logging in, go to Setup>Network>DDNS. You can modify the DDNS setup in corresponding fields. Domain Name: The default domain name is device MAC address. You can customize it here. Click on Test to verify if your new domain name doesn’t already exist. If it exists, please use another domain name until you have a domain name that is not used. If it does not exist, you may continue with your new domain name. If the device is connected through a router, then you need to log on the router to view all of the mappings and access the device via the domain name plus port number. Username: You can centralize management over multiple devices by providing a valid username (email address) here. 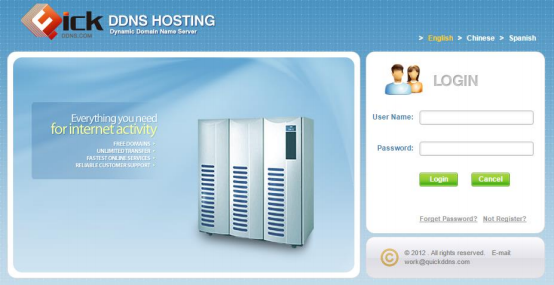 You need to visit www.quickddns.com and register with that username. If you have registered already, then fill in the registered username in this field. Please see Figure 3: Local GUI. • Domain name format: any combination of 0-9, A-Z, a-z, no special symbols. Max 60 characters. • Please fill in the correct username to avoid device ownership problems. 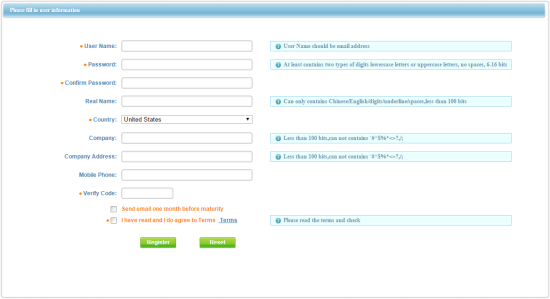 Please see Figure 4: DDNS Login. Click on the Not Registered link to enter the registration page. Follow the instructions to complete registration. Please see Figure 5: DDNS Registration. Fields with * are required. 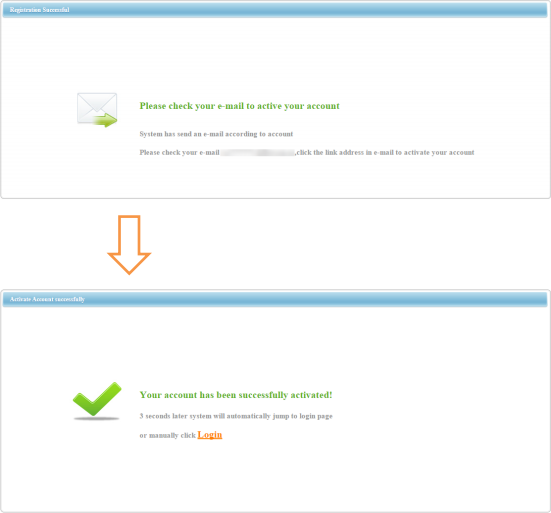 Once you are done, the system will send an activation email to your username (valid email address). You must activate the registered username by following instructions in the mail before using. Please see Figure 6: DDNS Registration Activation. After you have activated your username, you can login to the DDNS website to manage and view devices under your account. When you login to the DDNS website, go to Equipment to view and manage devices under your account. Click on the device domain name link to open the corresponding Web interface. Please see Figure 7: DDNS Management. 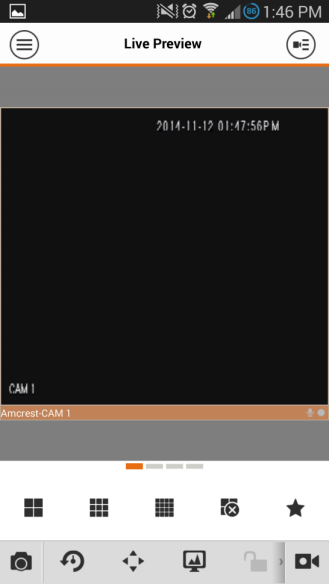 Install the Amcrest View app on your smart phone. After installation completes, run the client. Go to Devices and tap Add New Device. Please see Figure 8 and Figure 9. Note: You would need to input username and password for the first login.The default connection is P2P. Please tap this option and select QuickDDNS. After you have logged in successfully, you may select the device to monitor. Please see Figure 11: Smart Phone Monitoring. • This manual is for reference only. Slight differences may be found in the user interface. • All the designs and software here are subject to change without prior written notice. • All trademarks and registered trademarks mentioned are the properties of their respective owners. • If there is any uncertainty or controversy, please refer to us for the final explanation. • Please visit our website or contact your local retailer for more information.